Midtown East. Kind of a vague geographic area, I know. I'm not sure what else to call it, though. I'm also not sure how to divide it up, which I'd like to, because the area I'm thinking of—east of Sixth Avenue from 42nd Street to 59th Street—is huge. Additionally, Midtown doesn't really feel terribly contiguous and uniform in attitude as do many other Manhattan regions. The middle of Manhattan seems to repulse neighborhood definitions. It's all about business, tourism and recreation. Still, the area is full of history, a lot of it living. It has been the center of New York life—lived at its biggest—for a century. It still pulses like New York is supposed to. When you picture that stock shot of a sea of humanity making its way down a Manhattan sidewalk, it's always Midtown that you see in your mind's eye (usually Sixth Avenue). I know I'm going to miss more than a few things with this guide; there's too much ground to cover. So consider this a start. I'll add to it as things occur to me. THE SUBWAY INN: I'm going to kick off the tour by breaking my own geographical rule, and beginning above the 59th Street border, at Lexington and 60th. This intersection has four addresses that need to be visited, and none of them feel like the Upper East Side, least of all the wonderfully seedy Subway Inn on E. 60th. Perhaps the great Midtown dive, it's delightful dinginess it heralded by an incongruously grandiose neon sign. Have a cheap beer and pretend you don't care what goes on in the outside world. 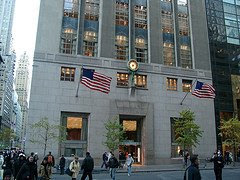 BLOOMINGDALE'S: One of New York's (and the nation's) great department stores sits across the street from the Subway. While the inside's not much to speak of, the facade on Lexington is still an Art Deco gem. We take the store for granted, but even a cursory study of its history boggles the mind. It was founded in 1861; has been at the current location since 1886; had its own subway stop constructed under the building; and the founding brothers, Joseph and Lyman, hatched the now common notion of window displays, in which shop windows are not simply crammed with merchandise, but showcase a couple items in an artful scene. GINO'S: Up Lexington a bit is this curious red-sauce mainstay, with its wooden phone booth, red zebra wallpaper and stubbornly loyal clientele. LE VEAU D'OR: An even older holdout sits around the corner, on 60th west of Lex. Le Veau d'Or was founded in 1937 and is frozen in time under the leadership of Robert Treboux, who has owned it for more than 20 years. 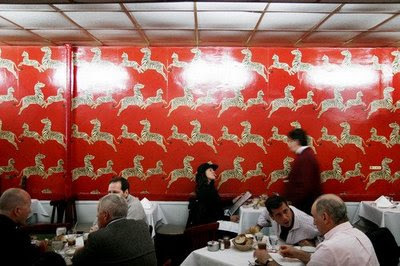 This is what fancy French restaurants in Manhattan were like 50 years ago. LITTLE BUILDINGS ON E. 58TH: Walk down Lex to 58th and go east until you cross Second Avenue. On the north side of the street you'll find a trio of small, low-scale old buildings so perfectly maintained they look as if they're part of a kitsch historical village. They're quite out of place with their surroundings. Built in the 1850s, and I don't know what their story is—why they survived or who owns them. They currently house a string of quaint businesses. LES SANS CULOTTES EAST: Go back to Second and walk south a block. Here is another curious and dusty French restaurant that does things as it wants to and doesn't care for trends or new ways. Unlike Le Veau d'Or, however, it's only 30-odd years old. It feels older. P.J. CLARKE'S: If it's the 19th Century or nothing for you, hike over to Third Avenue and 55th Street for one of the great tavern experiences in the world: P.J. Clarke's. It's not difficult to tell that the place has been holding its ground for 125 years. Even the conviviality and conversation of the patrons feels of a different era. Stick to the bar and small front eating room; they are the oldest parts of the joint. And don't miss the men's bathroom. CASWELL MASSEY: At Lex and 48th, making elegant grooming aids before your great-great-grandfather was born. PALM RESTAURANT: Back to Second Avenue and back to the 20th Century. The Palm Restaurant, on either side of Second between 44th and 45th (the original on the west side), is a fine New York dining experience for those who like steak, formally dressed waiters, white tablecloths, wood walls and plenty of character. Much of the latter comes from the murals that cover the walls, mainly caricatures drawn by past patrons. There are tons of Palms everywhere now, of course. Forsake them all. This is the one. CHRYSLER BUILDING: On 42nd. I don't really have to tell you about this one, do I? But New Yorkers often ignore the obvious and fabulous. Go in the lobby and remind yourself why you live in the city. THE OYSTER BAR: Ditto for GRAND CENTRAL TERMINAL. But it's always worth taking in, and most New Yorkers do so fairly often, if only because they need to use the subway or Metro North. Many, however, forget to take advantage of the train station's greatest treasure: The Oyster Bar, serving up seafood under Rafael Guastavino and Rafael Guastavino Jr. distinctive ceremic arches since 1913. Commuters of all kinds have stopped in here for a century for a civilized one-for-the-ride. There are three spaces: the bar, the lunch counter and the dining room. Opt for the first two; the last will cost you and the experience isn't nearly as fun. HIDDEN LUNCHEONETTE: Walk out of Grand Central on the Vanderbilt Avenue side, cross the street and enter 52 Vanderbilt. Halfway through the corridor that leads to Madison Avenue you'll find a vestpocket luncheonette. Once upon a time, all working New Yorkers fed themselves from such anonymous in-house lobby eateries. They are not many of an independent, non-chain variety left. This one has a sweet charm, and the food is cheap and good. BROOKS BROTHERS: Exit on the Madison side, jog down to 44th, and you'll be facing the stately flagship store of Brooks Brothers, American's oldest retailer. If the place seems stuffy, it has the history to back up the hauteur. Buy an Oxford shirt here, or a seersucker suit, and you're buying it from the store that introduced the style. Go inside and gaze at the plaque near the elevator which lists all of Brooks Brothers' former locations. It is a mini-history of Manhattan and the steady northern progression of the NYC mercantile world. ROOSEVELT HOTEL: At Madison and 45th, the Roosevelt was long at the center of New York activity, owing to its proximity to Grand Central (a tunnel once connected hotel and train station). Governor Dewey held court here when in the City. Guy Lombardo and Lawrence Welk played here. Many an affair was conducted in its rooms. FRED F. FRENCH BUILDING: Walk to Fifth and 45th, the northeast corner. Here's an often-overlooked architectural gem. Built in 1927, it's furiously ornate inside and out. PRIVATE CLUBS: The '40s between Grand Central and Sixth Avenue are home turf to New York oldest and most prestigious private clubs. Unfortunately, you can't get in to any of them and admire the interiors, unless you know somebody. But in case you want to eyeball the many landmarked exteriors, try checking out the Beaux Arts New York Yacht Club (37 W. 44th); The Harvard Club right next door (27 W. 44th); the Century Association, built by Stanford White (7 W. 43rd); The Yale Club (50 Vanderbilt); the neo-Georgian University of Pennsylvania Club (30 W. 44th). There are many more. And you can bet they all have great little grill rooms inside, where you sign for your meals instead of paying. ALGONQUIN HOTEL: Walk down Fifth to 43rd Street and go west to this hotel, which may have the most beguiling history of any lodging house in the nation. The interior is much changed since the Round Table days of Benchley, Parker and Kaufman—the Blue Bar is nothing like it was back in the day—but the lobby is still perfumed with the air of a genteel New York of yesteryear. Ordering a drink from one of the mismatched lounge chairs is a treat. And a cabaret show in the narrow, dark-paneled Oak Room can be heaven. As has been tradition, a hotel cat roams around the lobby. A ghoulish note: filmmaker Preston Struges, broke and forgotten, died here in 1959. NAT SHERMAN: Walk further down Fifth and around the corner to the preeminent seller of tobacco in Manhattan. They were forced to move recently from their perch at 5th and 42nd Street to a location at 12 E. 42nd Street. DIAMOND DAIRY KOSHER LUNCHEONETTE: Walk up Fifth to 47th Street. To feel like a true New York insider, walk inside the diamond dealer at 4 W. 47th, past the counters of gems, up the stairs to the left to a barely advertised diner on the narrow mezzanine level. This is the Diamond Dairy Kosher Luncheonette. Very Old School Diamond District. The most basic of kosher delicacies are served with no ceremony on paper plates at a long undulating counter and a smattering of small tables. I saw Jackie Mason here once. Afterwards take a walk up and down Diamond Row for an eyeful of this world unto itself. PRIME BURGER: Still hungry? Walk up to 51st Street and turn right to enjoy a simply prepared burger while sitting at a table that looks like an elementary school desk, at Prime Burger, resting in the shadow of St. Patrick's these 40 years. FIFTH AVENUE: If I numbered all the treasures to be found on Fifth Avenue, this guide would go on forever. Most of us historians and nostalgists don't really think of Fifth when we think of Old New York. This, I believe, is because many (all?) of the old businesses on this golden shopping strip are elite and pricey, and so we feel disenfranchised and alienated. I understand that. I feel it myself. But the truth is that there is probably no other shopping street in New York that has a greater concentration of venerable old businesses. So I suggest you dress fairly well, hold your head up high, enter and assert your right to inspect the following temples of high-end American consumerism: SAKS FIFTH AVENUE, founded in 1867, in its current building on Fifth since 1924; CARTIER, the world's leading purveyor of luxury jewels, in its present New York location since 1917, the former mansion of Morton Freeman Plant; the ST. REGIS HOTEL, perhaps the epitome of the small, exclusive New York hotel, and home to the KING COLE BAR, where the Bloody Mary was introduced to America; HENRI BENDEL, in business since 1896, in its current location since 1990; BERGDORF GOODMAN, on both sides of Fifth at 58th, housed in the Art Deco store on the west side since 1926; TIFFANY & CO., founded in 1837, inhabiting what is arguably the most beautiful building on Fifth, the 1940-built flagship store; and FAO SCHWARTZ, the toy store of toy stores. THE PLAZA HOTEL: This one-time crown jewel of hospitality is now sadly no longer open to the public. It's gone condo, and not happily, either. But the outside is mighty fine. 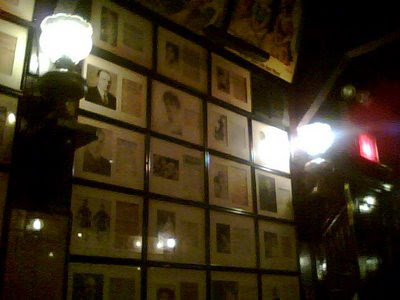 And you can still enjoy a drink at the historic OAK ROOM around the corner. Also, take a look at the nearby PARIS THEATRE, one of the last classy single-screen movie houses in Manhattan. JIM'S SHOE REPAIR: Walk east on 59th toward Park and get your shoes buffed at this ancient stand, inexplicably located dead center in a high-rent district. BILL'S GAY '90s: Walk down Park to 54th and hang a right to this unheralded former speakeasy near Park. It's as good a place—and as old—to lift a few as P.J. Clarke's and usually much less crowded. Good wall gazing for fans of boxing and the theatre, 19th-century style. "21" CLUB: Here's a good place to end, on 52nd between Fifth and Sixth. A former speakeasy, it is the last true vestige of so many New York eras: the Roaring '20s, when drinking was illegal; Cafe Society of the 30s through 50s; and the time when this stretch of 52nd was once jazz-centric Swing Street. Despite the recent tie debacle, I still love it. It occurs to me that I haven't mentioned either ROCKEFELLER CENTER, ST. PATRICK'S CATHEDRAL or the WALDORF=ASTORIA. By all means, go and explore and admire them copiously. Thanks for posting this. I love wandering around Midtown. The Fred F. French building is absolutely one of my favorites in town. another great tour. Thanks Brook...keeping hope alive! Librarie De France will be closing this summer. Been in business 72 years. Worth visiting. It on "the mall" in Rockefeller Plaza (where you walk through to the skating rink.) They are digging up all kinds of crazy stuff in the basement. Sales should get better and better as time passes. Spanish books, too. Also, don't forget Prime Burger at 5 E 51st! Librairie, not Librarie, btw. I think I spelled that wrong! Oooooh, good call on the Prime Burger!!! Good one, Carol. I will add Prime Burger. building when i pass by it, still gives me shudders. The Year 1958: The French Building with tenants such as ad agencies and photo-retoucher's etc. Me, A teen aged photographers Assistant on my first professional job . plate making at Conde Nast. Me, Leaving the box of retouched advertisement photographs on the 3rd avenue bus while daydreaming. Me, Getting heart failure and nausea then fired after a good yelling from my Boss. Funny how memories linger on. Michael (of Tin Pan Alley). Cute; you began with a dive bar and ended with 21 Club. You forgot Tudor City! I'm a resident so forgive me if I sound sensitive. A small enclave overlooking the UN, designed and developed by Fredrick French. A (formerly 3) star restaurant. Two very popular privately-owned public parks. An undiscovered gem. Strider Records Counting Down the Days? Lost City Asks "Who Goes to Gino?" This Is New York, 1992!